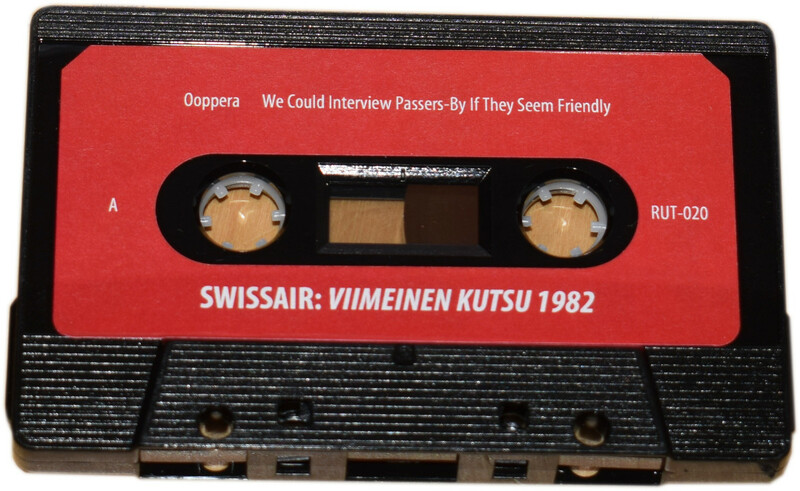 And speaking of Swissair…here’s an item called Viimeinen Kutsu 1982 (RUTON MUSIC RUT-019), and constitutes another historical document from “that” period which some might call a “golden age” of home-cassette recording when it looked like the teeming underground artists might stand a chance of toppling the dominant political structures (the evil twin towers of Thatcher and Reagan) by burrowing from underneath in some way. In Helsinki in June 1982, the six teenagers of Swissair (most of them aged around 17-18 years old) got together at Anton Nikkilä’s place to record this music over two days when his mum was out of the house. Swissair at this time was the “classic” lineup of Järi Harkönen, Pietari Koskinen, Mikko Kuussaari, Juha Soivio, Mika Taanila and Nikkilä. Of these, I might want to single out Mika Taanila, who impressed me mightily in 2009 with the collected works of Musiikkivyöry from 1981-82, a palpable set of teenage alienation and angst captured on ferric oxide and rescued onto CD. On Viimeinen Kutsu 1982, the A side is occupied by two lengthy experiments in random sound-generation instigated by Nikkilä. The first one, ‘Ooppera’ is a duet between him and Taanila, working to typed instructions that directed the work in some way. It’s not clear how serious these instructions are, but they’re reproduced on the cassette cover here, and clearly it worked to the extent that the pair were able to produce a bizarre series of unmusical sounds in a deliciously primitive manner, and insert some spoken word elements so that it does indeed resemble an “opera” (in the same way that a book of matches might be considered a concrete poem, if you read it the right way). Hard to believe this piece of cold dissonant absurdity was directly inspired by The Residents’ Not Available LP. After this the remaining members of Swissair piled into the house to record ‘We Could Interview Passers-By If They Seem Friendly”. The story here has all the hallmarks of how great post-punk music got made – achieved in the small hours of the morning, recorded in a public park, battery operated equipment, toy instruments. Using these unpromising elements, the six-piece embarked upon their idea of what “free improvisation” should be. The results – strung-out, disconnected, in need of some strong coffee – are just wonderful. Alternative TV and The Door And The Window could not have bettered this in their day, not even if they took a cocktail of downers and moved to Iceland. The finishing touch for me is when the birds start waking up and add their dawn chorus to the plunking, pecking and strumming antics of these young Finnish loons. For all its misfires and tentative stabs, this remains a radical document of raw genius. B side of tape sees a return to a somewhat more “conventional” rock music setup, as Swissair blam out their Velvet Underground and Wire fantasies with a two-guitar, bass and drums combo. Well, that’s not strictly accurate. The fact is they wanted to create the most disconnected, formless and non-harmonic rock music they possibly could; a plan that’s reflected almost directly in the long title of the first track here, with its ambition to create a new musical notation system. They were inspired to do this by the thoughts of Brian Eno, a fellow who has a lot to answer for, and one of their methods to deflect common sense was to wear isolating headphones so they couldn’t hear each other. Anything to avoid that “default” mode of playing and accidentally lapse into patterns or playing a conventional “riff”. The tension – and it’s a strong tension – comes from those VU-Wire aspirations, which evidently couldn’t help surfacing in spite of Swissair’s best efforts to suppress their natural instincts. You can imagine the hullaballoo if Anton’s mum had come home at any time during these recordings, but to me it’s just one more measure of their success. “A specific kind of collapsing rock,” is the apt description printed on the press notes here. And to think people give credit to Keiji Haino being the sole perpetrator of this type sound, e.g. on Allegorical Misunderstanding…score another goal for Helsinki. All in all, I don’t see how any sane person could resist wanting a copy of this astonishing release. From 12th June 2017.